It's an age old charcoal debate—lump or briquettes. If you're Cowboy fan, the answer is probably lump as this company has been manufacturing the stuff for over 100 years. It all started in Southern Ohio by a man named Jess Rollins who went farm to farm and burned cleared trees into charcoal. In the 1930's, the business was under the helm of Roland Crace, who centralized production to kilns. While staying in the Crace family, the business then shifted and expanded over the years, including the brand Pioneer Charcoal in the 1950's and Hickory Specialties in the 1970's, producing both briquettes and liquid smoked. Hickory Specialties was bought out in 1992 by Bob Evans Farms, which is when Don Jr. and Sam Crace created Cowboy Brans. The focus then shifted to primarily lump charcoal, produced in Albany, KY. 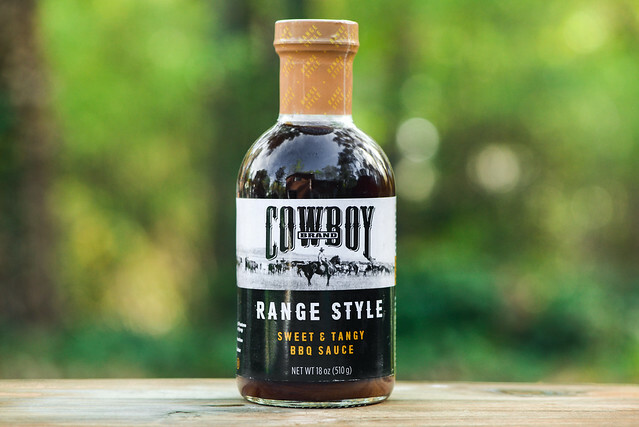 Cowboy Brand is now a subsidiary of Duraflame and includes a large line of products from wood chips and chunks, to barbecue sauce, to their core lump charcoal product. 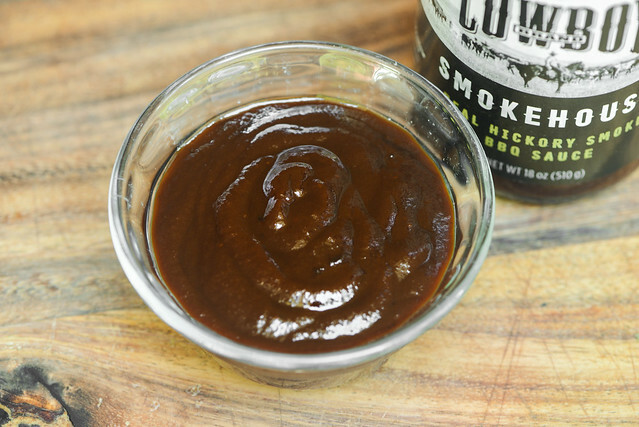 Your nose fills with the strong aroma of molasses and smoke on the first whiff of this sauce. 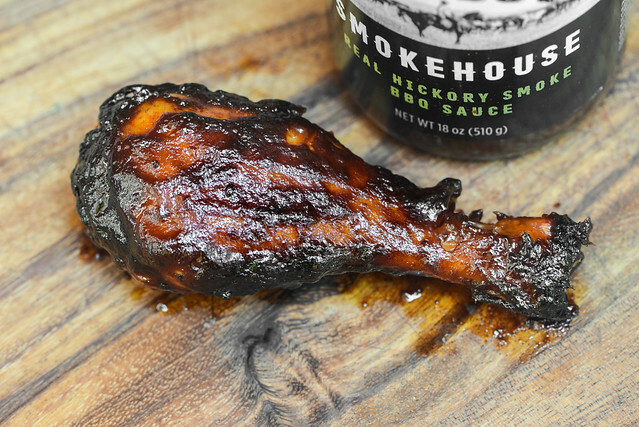 That heavy smokiness, along with a more mild vinegar, gives the molasses a deep, and not overly sweet, profile. Also mixed in is an acidic tomato component and faint onion that's content to sit in the background. There a little peppery earthiness, but no real heat, which may be drowned out in the aroma by the overall sweetness and boldness. This dark maroon sauce has a semi-flat sheen, is slightly textured, and completely opaque. That dark color and lack of transparency makes it difficult to point out any spices except a few specs of black pepper here and there. The sauce has a medium-thick consistancy and falls first in one large drip off of a suspended spoon. Then five to six smaller, quick drips release, followed by one or two slow ones. Then the sauce ceases its pour and ends with a medium coating still left clinging to the silverware. Despite the strong aroma, the initial taste is rather nondescript and flavorless. A mild sweetness comes in first and is then quickly pushed into near submission by a strong acidity. It's at this point that an equal mix of tomato and molasses starts to add real depth to the sauce, while a hefty liquid smoke adds a strong pungency. 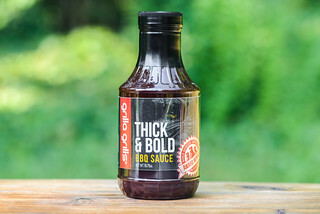 These flavors are all upfront and dominating, making it hard to make out the onion and garlic spices the are in the background, but as the sauce leaves the tongue, a mild heat does work its way in to leave a final aftertaste that's heavily smoky, tart, and lightly spicy. This sauce coated the chicken in a medium, uneven layer that baked down well over indirect heat. When moved to direct heat, there was some burn off along with strong caramelization to the point that some bits of sauce became completely blackened. That strong smokiness form out of the jar was dialed up after being cooked, making it the defining characteristic of the meat. The molasses persisted as well, giving the leg its other main trait. The other players, like tomato and vinegar, mellowed out, but came into play after subsequent bites, while the more nuanced flavors of onion, garlic, and pepper, became completely lost. This was the third in the line-up of Cowboy Brand sauces I was provided to try, and unfortunately, I did not save the best for last. I'm not a big fan of overly bold sauces that hit the smoke and molasses hard, and this is what I got here. That being said, the flavor out of the jar tasted like it was made of quality ingredients and there were enough layers and complexity to put it ahead of your average supermarket sauce. My impression took a downward turn though when my chicken tasted like it was left in the smoker too long after being cooked, with an acrid smoke flavor that overpowered the meat. 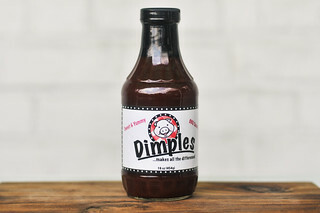 So I'd skip this as a grilling sauce and look to it as mainly a condiment on heartier items—I think it would work really well on burgers or a dip for steaks or brisket. You all are lucky Meatwavers because Cowboy Brand sent me extra sauces to giveaway, so I have two bottles to give out to start the new year off right. 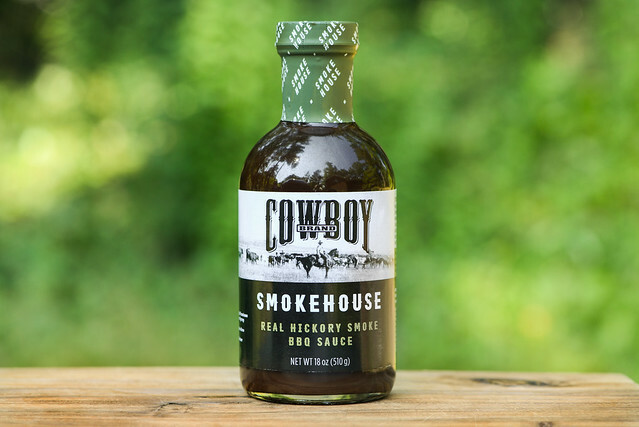 If you'd like to be entered to win a bottle of Cowboy Smokehouse, all you have to do to enter is to comment on this post with your grilling or barbecue new year's resolution Deadline for entries is 11:59pm on Tuesday January 2, 2018. Read the official rules for more details. One entry only per individual. Good luck! I plan to spread out the variety of what I smoke. To move away from mostly brisket, ribs, turkey and chicken and try new things. I live in Texas where I have a longer grilling season than what the weather in Northern states will allow. I think I will resolve to fire up the grill at least once a week in the winter months. I think I need to give pastrami a try. Or maybe smoked chicken. No, both. I would grill once a week at least for more healthier cooking. I grill everything I can; especially pork chops and chicken. I resolve this coming year to grill more and eat out less!